It comes in a nice attractive and slim box, which has a door that allows you access inside. The mobiPRO comes with a membership card that grants you access to Eyefi Cloud and unlike the non-pro version, it also comes with USB SD card reader, albeit quite an awkwardly shaped one. Again the mobiPRO is in the form of a class 10 SD card, albeit with an integrated WiFi module smooshed together with some flash memory, just like it’s predecessor. 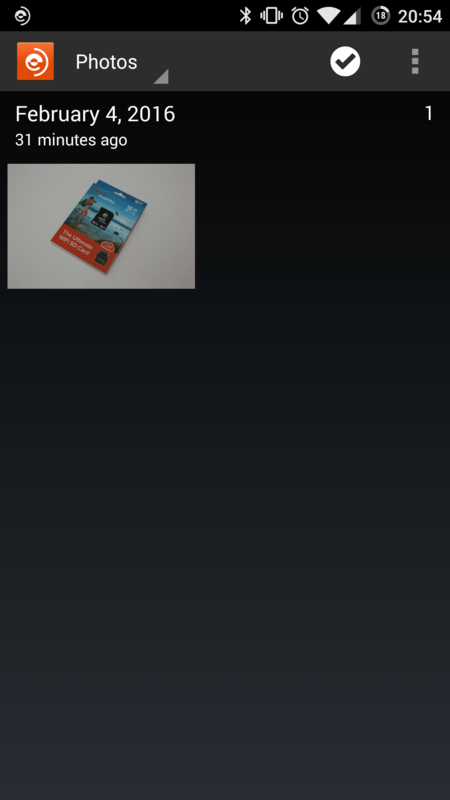 To the untrained eye, it looks like any other camera SD card. To enable the WiFi connection of the mobiPRO, it must first be installed in a camera and then connected to the app on you smartphone or tablet. As is stands there is both an iOS and Android version, so you don’t need to worry what device you need. Additionally, the desktop app can be downloaded from the website, however it will only work if your PC has WiFi capabilities – like laptops do, as this is required to form the link with the mobiPRO. To connect to the SD card, you simple take a photo on the camera and it automatically connects and then sends the image to the tablet/smartphone. You can then select each image you take on your device and can view EXIF information, make some minor edits such as crop & rotate and even select it to upload to the cloud. I used this SD card in my Canon 450D DSLR, although it is compatible with hundreds of different models. As RAW files are massive in size, the default file type setting is JPEG, which is also the most common file type for photos. Whilst the JPEG format is default, you can turn on RAW in the settings to transfer to mobile devices, otherwise, it’ll only transfer RAW files on the desktop app. To test out the mobiPRO, I first connected it to my OnePlus 2, iPad Mini 3 and then my laptop. The former two devices were fairly straightforward to connect to, although it did take a couple of image captures to finally detect. At first I tested the JPEG transfers, so I snapped a dozen or so photographs and let the app handle the transfers. Whilst it wasn’t instantaneous, it quietly transferred the photographs in the background whilst I continued shooting. On my OnePlus 2, it was noticeable slower whilst it was transferring, so it does take a fair resources to deal with, considering the file size of each photograph was in excess of 30MB. This was more prevalent when I turned on the RAW transfer mode and discovered that it crashed the app on occasion, however I didn’t notice it on my iPad. The desktop app worked in a similar way, although provides the ability to change the settings on the card. At first you have to create a direct connection, so you can then configure the card to connect to a local network. The app allows you to transfer the files directly into Adobe Lightroom making it perfect for professionals. Did your model blink during a photo? No problem! The app has a very useful feature of selective transfer, enabling you to choose which photographs get synced. The files are both transferred to your device and stored on the onboard flash memory (in this instance 16GB’s worth), meaning for those cameras it is not compatible with, you can use the mobiPRO like any regular SD card. 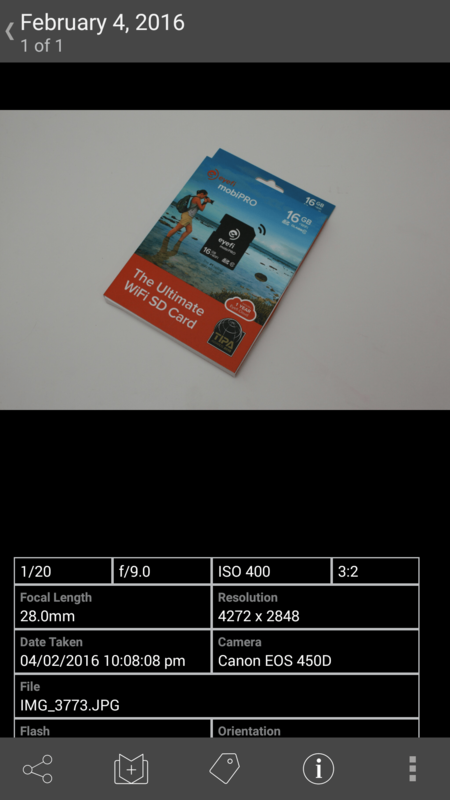 When I last took a look at a WiFi SD card from Eyefi, it was targeted at those who don’t need to shoot in RAW and it allowed seamless transfers of JPEG files easily. Since then, Eyefi have really revamped the app and overall look of everything, resulting in a more polished product. This particular mobi is aimed at the professional photographer, making it ideal for those who don’t wish to have either a cable connected to the camera or have the arduous task of removing the SD card after each shoot. That said, more and more cameras are now featuring in-built WiFi modules, so mobi’s days could well be numbered. I really liked the “snap-happy” selective transfer mode, as I am a strong believer of “never taking too many photographs”, so having the ability to select which ones I want to sync is ideal – particularly when I photograph products for review. For professional photographers who use the mobiPRO during a shoot, it makes it ideal for showing your client a select range of photos, without having to trawl through hundreds of them. Overall I found the mobiPRO a very useful bit of kit: it breathed new life into old Canon 450D adding the useful WiFi capabilities and has some great backup features – a year’s worth of cloud storage included in the cost. Whilst the app wasn’t terribly stable when transferring RAW files to my smartphone, this could just be down to the resources required for transfer, but at the JPEG level, it worked great. The standard flash memory also means you can use it on cameras that are not compatible or already have WiFi functionality and the included SD card reader is a nice touch. Thanks Eyefi for sending this over.